If you're looking for a way to add a touch of industrial style to your home without spending a fortune, DIY gurus Theresa and Mark Clement of MyFixItUpLife have an easy (and inexpensive) DIY project that you can complete in less than an hour this weekend. Made up of black steel pipe parts that can be purchased at your local hardware store, this cool shelf is a unique way to create open storage that you'll want to show off. Read on to see how you can have the materials* to complete this project sent right to your home FOR FREE so that you can get started right away. *Paint and clear coat not included. We announced the winner in our October 24th newsletter here. Theresa and Mark have also teamed up with Dove to offer 3 guys the opportunity to win a home upgrade worth $15,000, a private consultation with the Clements, and a year’s worth of Dove Men+Care hair products. Click here to see how you can win! 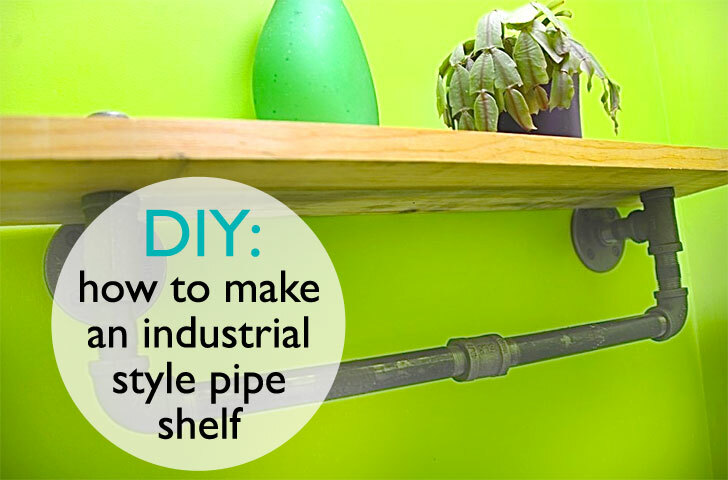 Check out the Clements’ video tutorial about how to make an DIY industrial pipe shelf below and don’t forget to enter to win all of the parts you’ll need to build one of your own. I am re-decorating my sons room as a Christmas gift. He would love this shelving!! We are doing everything STEAMPUNK!! I get limited natural light in my apartment, so I would place this shelf near a window and clamp meat grinder planters to them for my plants! I would put this in my newly redone bathroom as a bath towel rack! Since we have a studio, my husband and I have had to be creative about our storage spacing on the wall. This would be perfect in the living room for knick-knacks, our old college books, our vintage typewriter, and a lot of that neat decor we have been wanting to display. These are super cool and fun. I'd put one (or a few) in the living room above the TV. Large wall in need of some funkiness and this could be the perfect plan. #1 Always take the labels off, use a razor blade #2 Left untreated the pipe will rust so it is not suitable for showers #3 Paint the pipe before you put it up #4 A union connection is better at the bottom the a coupling #5 Stain the wood #6 Have fun! Ohhh, I would love to get my hands on a shelf like this for my apartment! I live in New York, so space is always limited, but this would be great next to the main door for coats and such! I would use multiple shelves as kitty perches along the wall of my living room. Would go great with my homemade cat trees and condos!!!! Simply comment below about where you would put your shelf and why by Tuesday, October 21st. We'll select and announce the winner of the giveaway on Wednesday, October 22nd in our newsletter, so make sure you're signed up to receive it! NOTE: This giveaway is limited to residents of the United States.